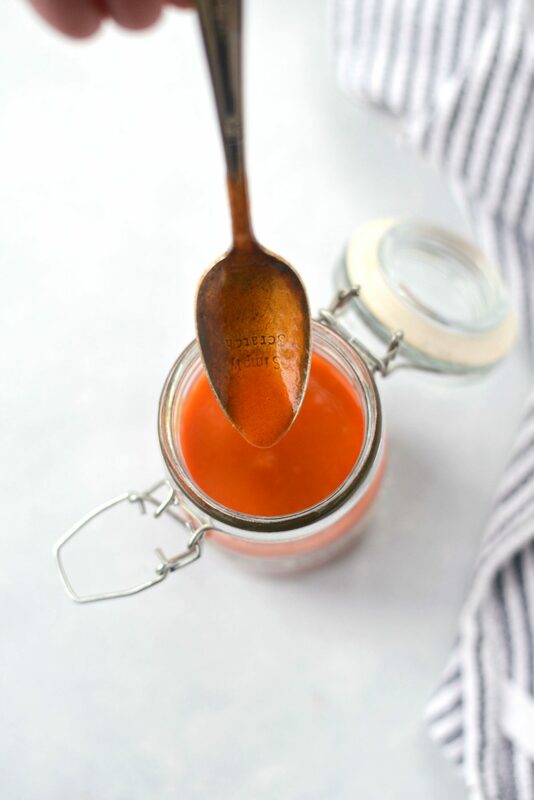 There’s no need for store bought when you can make this quick and easy Homemade Buffalo Wing Sauce with just a few ingredients! 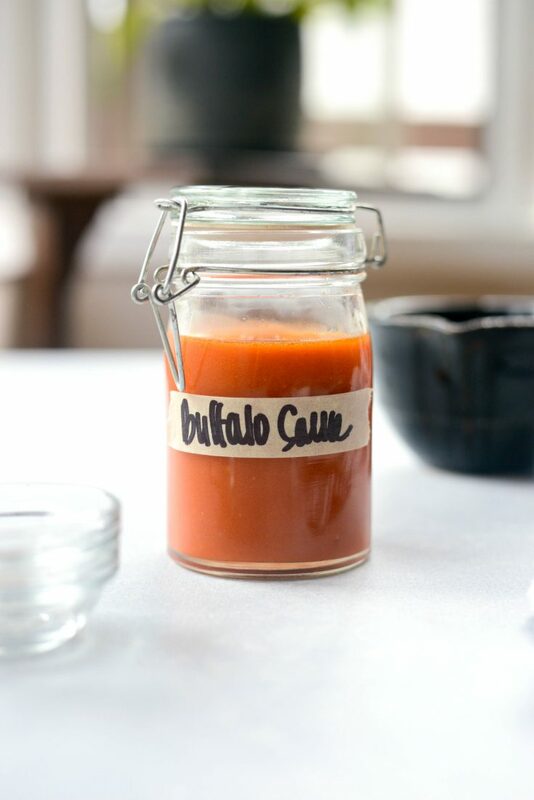 Butter, garlic powder and cayenne pepper dress up regular hot sauce for a simple buffalo style sauce. And this sauce isn’t just for wings! Dress up roasted or grilled veggies and drizzle over freshly popped popcorn, the options are endless! Makes about 1 cup in less than 10 minutes. I’m pretty sure you can add buffalo sauce to anything and it’s guaranteed to be delicious. amiright? Spicy, garlicky with that vinegar tang, it’s no surprise it’s so popular. Wether it’s used as a sauce for crispy chicken wings, drizzled on a pizza, veggies, popcorn or in a chip dip, buffalo wing sauce is fabulous and adds a perfect buttery and spicy touch. Of course you could always pick up a bottle of buffalo sauce at your local grocery store, but if your fridge is like our fridge, there’s a good chance (read: always) there’s a bottle of Frank’s Red Hot hanging out in the side door. So I use Frank’s as a base to make a simple, quick and homemade buffalo wing sauce. Technically not 100% from scratch, but if you have a recipe for hot sauce that tastes just like Frank’s, then please hook your girl up! 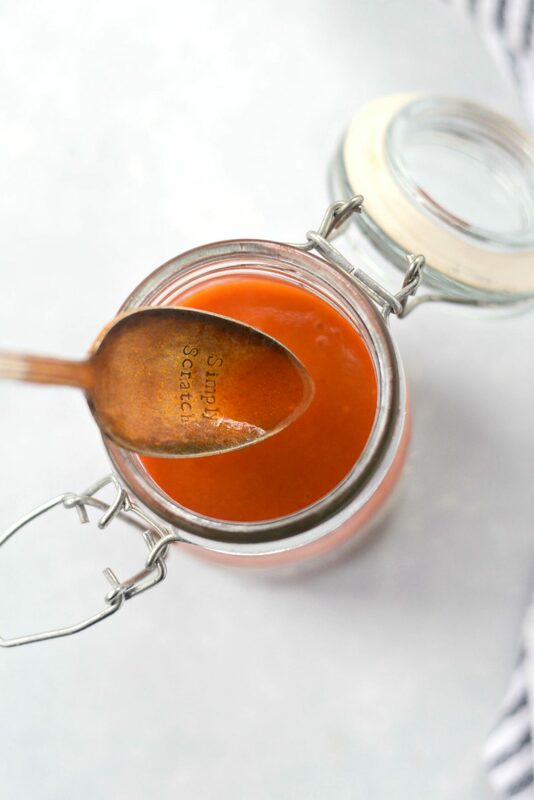 In the meantime, make this sauce and drizzle it over popcorn (do it!!) we add extra black pepper to ours, and get ready to fall in love with the delicious heat! 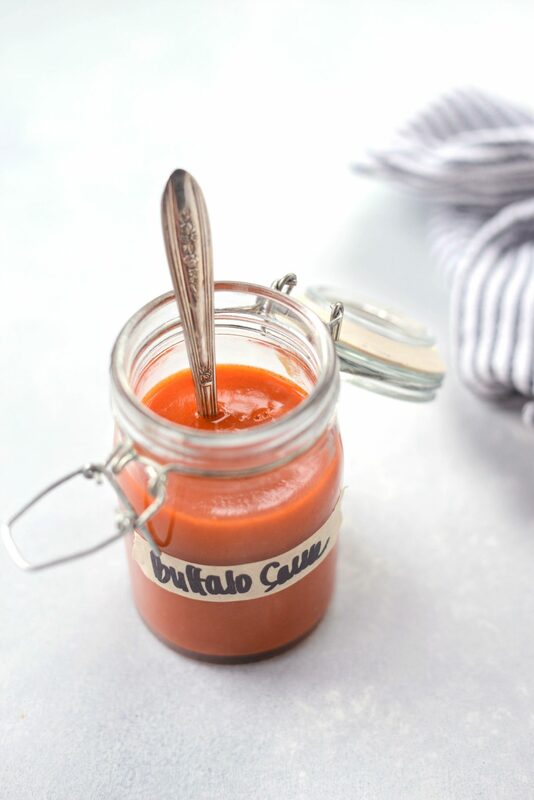 What you need to make this homemade buffalo wing sauce is a few basic pantry and fridge ingredients. Ingredients like hot sauce, butter, garlic powder and cayenne pepper. 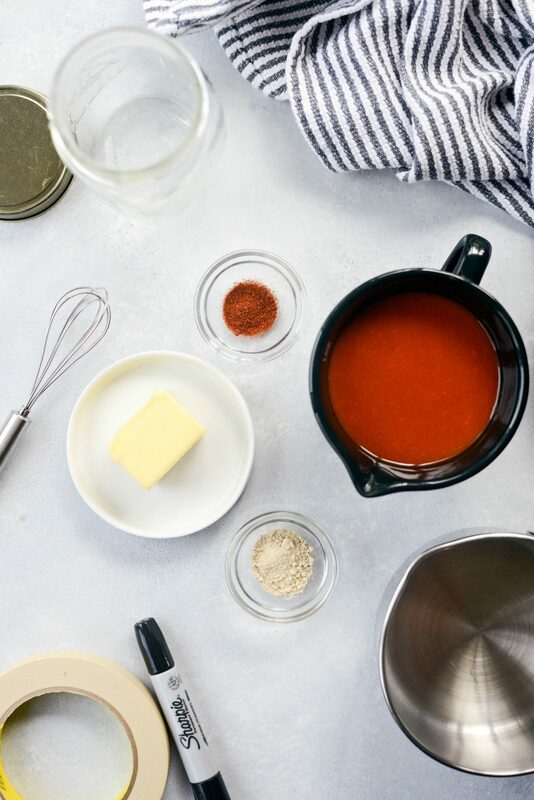 This is my go to recipe for buffalo wing sauce, but you can make it extra by adding in a few splashes of Worcestershire sauce, onion powder or paprika and other spices. 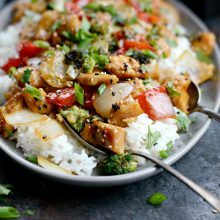 In a small skillet add 2/3 cup hot sauce, 3 tablespoons unsalted butter, 1 teaspoon garlic powder and 1/4 teaspoon cayenne pepper. Then whisk, while heating on low until the butter is melted and mixed throughly. 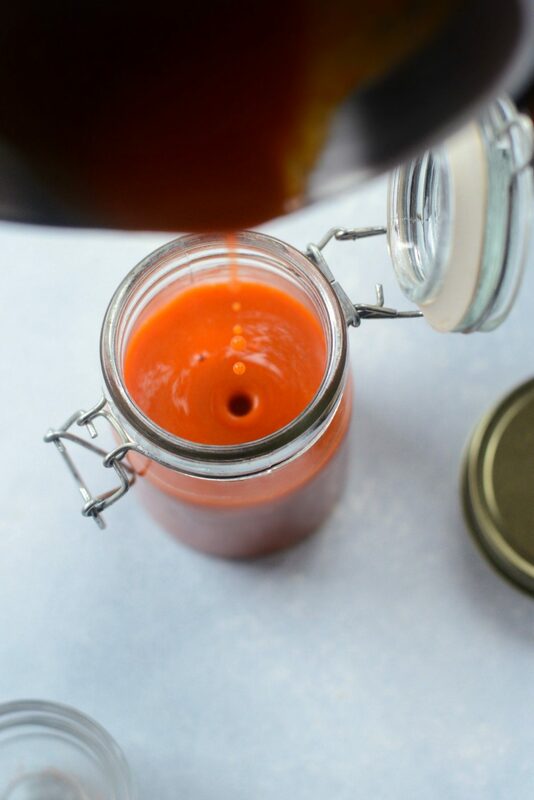 Pour the homemade buffalo wing sauce into a glass jar or container that has a tight-fitting lid. 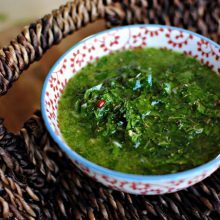 Use this sauce immediately or refrigerate for 2 to 3 weeks or longer. For a thicker sauce, bring the buffalo sauce to a low simmer. Then in a medium, heat safe bowl beat an egg yolk. 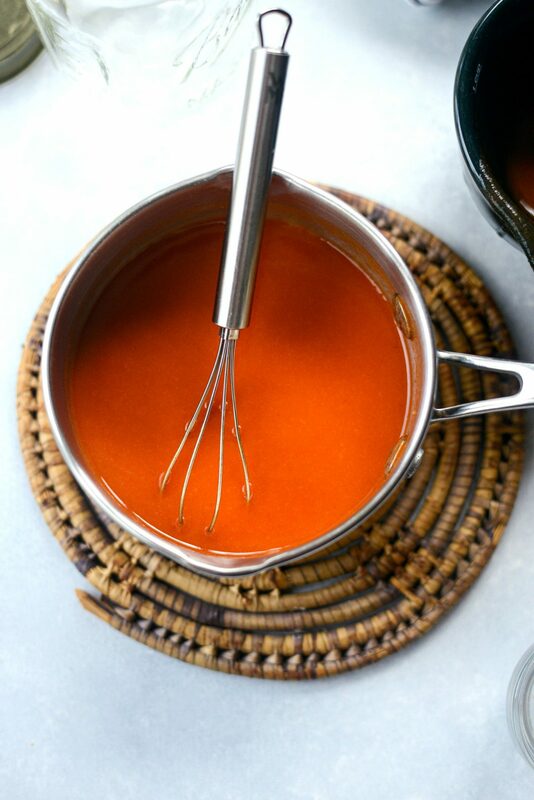 Continue to whisk while slowly pouring in the hot buffalo sauce. Once the hot sauce hits the egg it should thicken immediately. Enjoy! 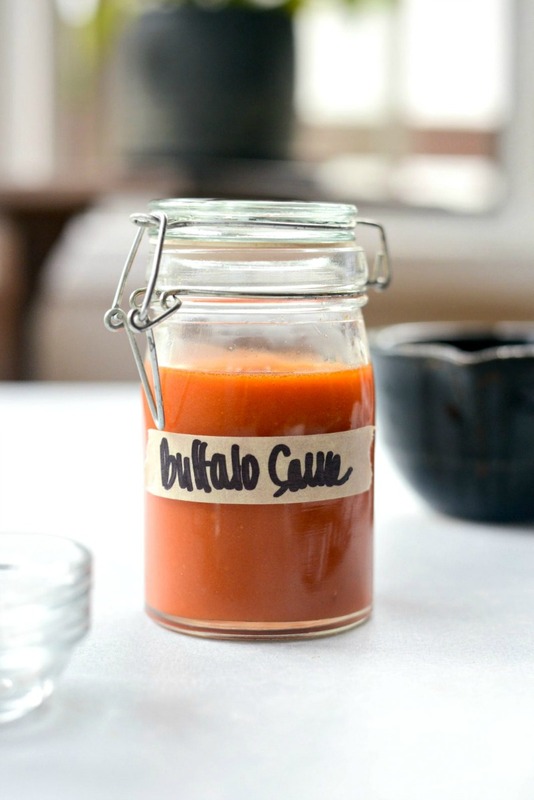 And if you give this Homemade Buffalo Wing Sauce recipe a try, let me know! Snap a photo and tag me on twitter or instagram! 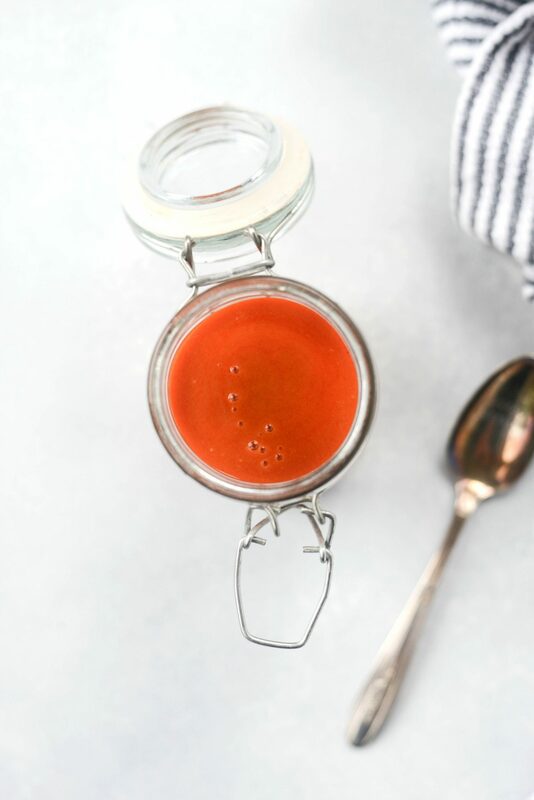 There's no need for store bought when you can make this quick and easy Homemade Buffalo Wing Sauce! Butter, garlic powder and cayenne pepper dress up regular hot sauce. Drizzle this over chicken wings, roasted or grilled veggies and freshly popped popcorn! 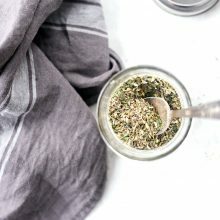 Makes about 1 cup in less than 10 minutes. 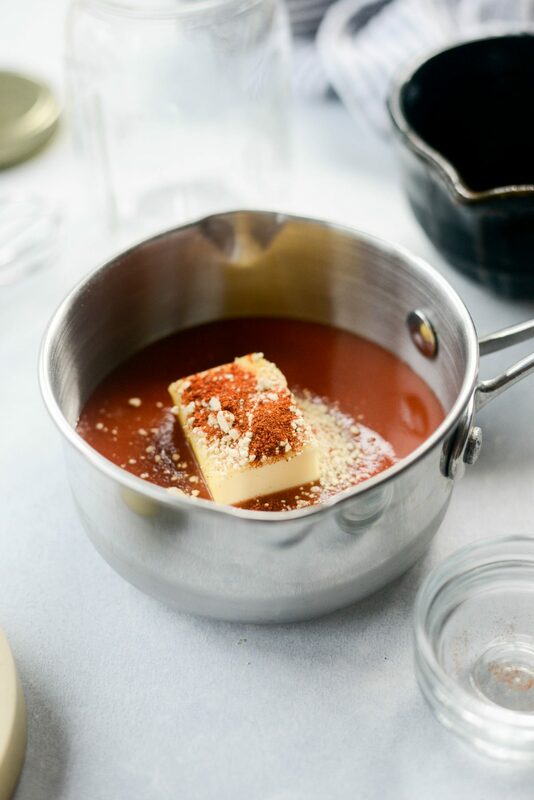 In a small saucepan, whisk together the hot sauce, butter, garlic powder and cayenne pepper. Heat on low until the butter has melted and mixed throughout. I CAN’T wait to make this! BTW I love the spoon that says simply scratch!! Do you think you could substitute a vegetable oil for the butter?